Beau Beau and Angie's Fur Days: Can I go? suitcase and hiss and meow loudly. how long is she gonna be gone this time? awwwwww, how can she resist you?! Oh Beau you look so cute in there. I think your Mom should just take you with her. If she does not want to, come visit the 2Bs. My Mom wants to know how your Mom can resist that picture! o, nice try. my mommie sez she would haf tooken u's wif hers. o, Beau, u sure is cute. You fit so well in that suitcase, it was obviously designed for you. Very cute, Beau. I hope she comes back soon, play nicely with Angie! Maybe you could get the bathroom finished as a surprise for when she comes back? Hey, Beau Beau, is you grippin "the cat's pajamas?" 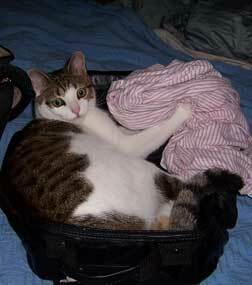 You haf to go wif yur Mom, ofurwise, she'll be alone. But I'd hate fur you to miss the party. Can you go on sub-at-tickle wif yur mom AND teleport to the party?